As work continues on the final design and planning for the new I-69, many new residents to Bloomington may not be familiar with this project. 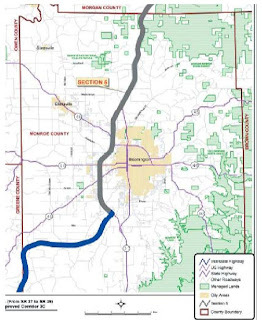 To the right is the map of the proposed route through Bloomington/Monroe County. The complete project will connect Evansville, in the south west corner of Indiana, with Indianapolis. It is designed to increase commerce in southern Indiana.